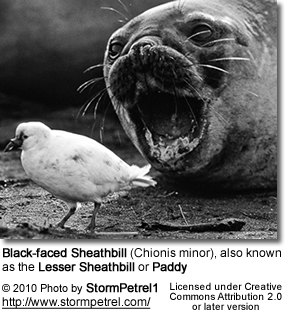 The Black-faced Sheathbill (Chionis minor), also known as the Lesser Sheathbill or Paddy, is one of only two species of sheathbills, aberrant shorebirds which are terrestrial scavengers of subantarctic islands. 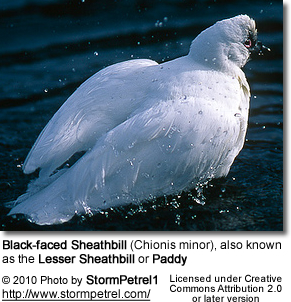 Dumpy, short-necked, pigeon-like birds with white plumage, black bills, caruncles and facial skin. Measurements: length 38-41 cm; wingspan 74-79 cm; weight (male) 530-610 g, (female) 460-530 g.
Restricted to subantarctic islands in the southern Indian Ocean: the South African territory of the Prince Edward Islands, the French territories of the Crozet Islands and Kerguelen Islands, and the Australian territory of Heard Island. 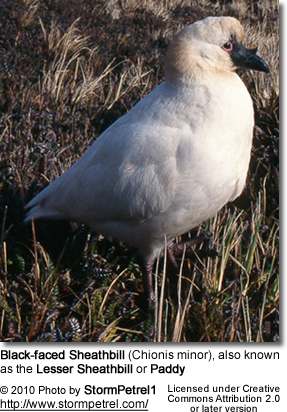 The birds on Heard Island comprise an endemic subspecies, Chionis minor nasicornis.